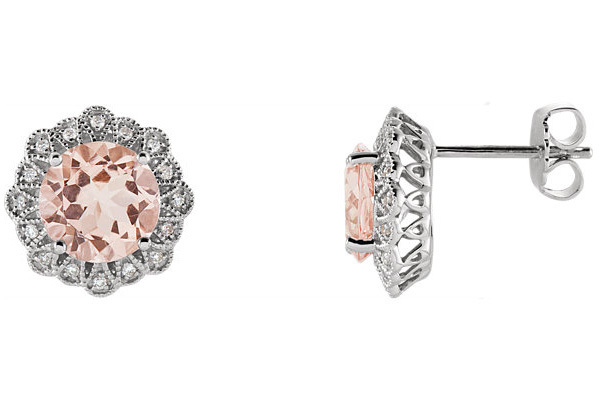 For those who like something a little more vintage, these Antique-set morganite and diamond earrings in 14K white gold from Apples of Gold Jewelry would make the perfect gift! These beautiful 14K white gold earrings have overall dimensions of 1/2 inch in size. 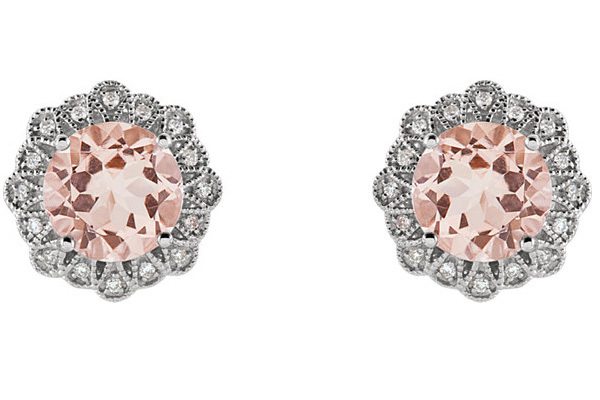 In the center of each earring is a 8mm by 8mm round faceted genuine morganite gemstone, which has a beautiful pink-peach color. The earrings also have a total of 32 diamonds for the pair, which total 0.125 carats (1/8 carat), and are rated H-I for color and I1 for clarity. The earrings have friction-post push-back closures, and for those who are taken with the design, they are available with a matching pendant, as well! We guarantee our Antique-Set Morganite and Diamond Earrings, 14K White Gold to be high quality, authentic jewelry, as described above.